Celebrate National Donut Day with Children's Author/Illustrator Laurie Keller & Arnie the Doughnut Costumed Character! Join Laurie Keller & "Arnie the Donut" costumed character for a celebration of National Donut Day! Laurie will host an interactive children's presentation and booksigning - complete with doughnuts (of course!) and fun activities to take home! As an added bonus, Schuler Books will be offering early Summer Reading Club registration to event attendees. Laurie Keller reads from The Scrambled States of America. Laurie Keller reads from The Scrambled States of America Talent Show. 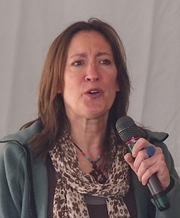 Laurie Keller is currently considered a "single author." If one or more works are by a distinct, homonymous authors, go ahead and split the author. Laurie Keller is composed of 2 names. You can examine and separate out names.